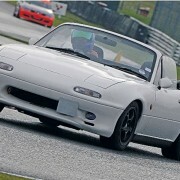 The iconic Mazda Miata has been around for 22 years offering a true, top-down, sports car experience. With its 50/50 weight distribution, nimble handling, and simplistic approach to engineering, the Miata MX-5 is inexpensive, easy to maintain, and fun to drive. 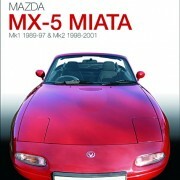 Now available is the Essential Buyer’s Guide for the Mk1 (1989 – 1997) and Mk2 (1998 – 2001) generations of the Miata MX-5. 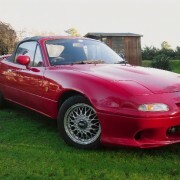 The MX-5 is a true testament to itself as the ‘world’s best-selling sports car,’ and with the earlier MkI and MkII available for modest prices, it is the perfect choice as a fun and enjoyable daily driver, a weekend track car, or a project base for a kit car. 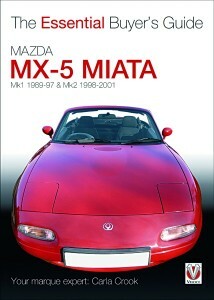 This book will help you get the MX-5 of your dreams. Carla Crook’s passion for ‘the world’s best selling sportscar’ began seven years ago with a British racing green Eunos Roadster; a car that also won over her husband Tony, a naval engineer and mechanic. 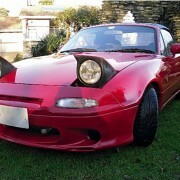 Carla is an active member of the MX5 Owners’ Club and the MX5 Nutz forum. When she’s not helping her husband fettle a project car, or out driving her Roadster, Carla is a busy working mum to three-year-old Harriet – a petrolhead in the making!